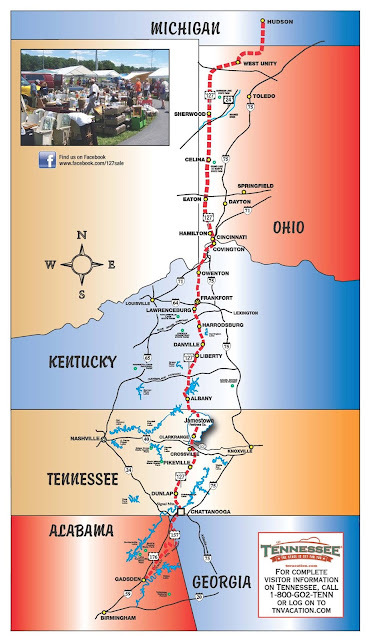 So Saturday Mom and I headed out bright and early to tackle the 40 mile Indiana US 38 garage sale route from Noblesville to Hagerstown. I really wish I could've taken some pics along the way, but there were WAY more sales than I anticipated. It was really cool how the entire towns were participating. Well, I got some cool stuff, and hit the jackpot in a few instances. So, let me show you some pictures already! 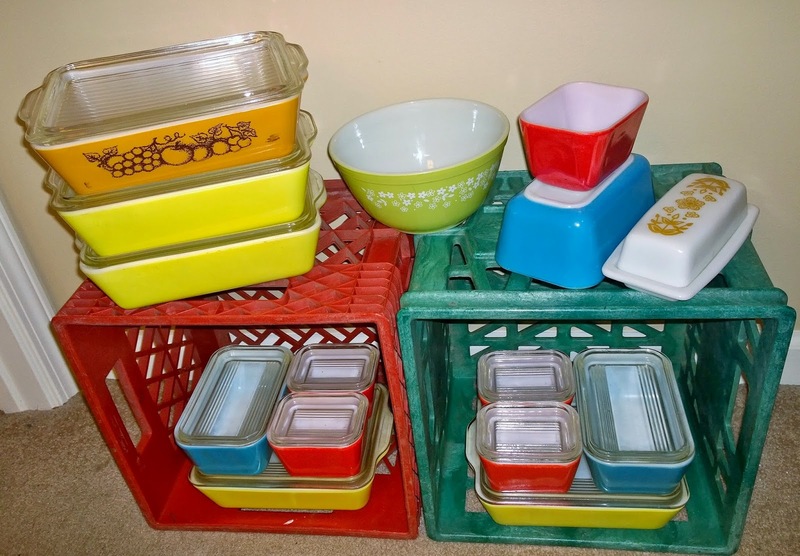 So, of course one of my major scores was this lot of Pyrex. I actually got all of it from one person except the crazy daisy bowl, the red fridgie with no lid, and the butterfly gold butter dish. This man had tables upon tables upon tables of Pyrex and other vintage kitchen goodies set up. I'd never seen so much in my life at one time. I bought every single fridgie he had (and then he threw in the lidless blue 502). If you couldn't tell - both primary sets are MINT - seriously not a crack or a chip! Andddd they both have the old-style lids! Both yellow 503s are also minty and have old style lids. The old orchard has a few scuffs, that I should be able to get out with a little elbow grease. But, here's the weird thing about this piece... when I look at, I see nothing wrong, but when I set it on a stack like this or a flat surface, it's a little wobbly. The lid to it also don't quite sit flat. It's also a little wobbly. I tried the lid on the other 503s and had no issue. I tried other lids on the old orchard and they were wobbly. So it leads me to believe that the fridgie itself is a little off. Obviously there's nothing I can do, but it's just weird! Have you ever had a piece that wasn't quite right? Both of the aluminum coffee pots came from 2 different stops. And I paid the same price for both of them. I was floored at the price on the large one. I need a replacement vintage glass percolator top the small one. Does anyone have one? I sell so many sifters, it's unreal. However, I have a huge stock of the plain Bromwell ones with wood handles. These 2 are unique. I wish these recipe boxes had old recipes in them. And 2 little toothpickers. I always, ALWAYS buy the Fire King McDonald's mugs. They're a very consistent seller for me on eBay. I love this glass top enamel fridge dish. I need a mint green one to go with my green enamel set (I've seen them and know they exist!). 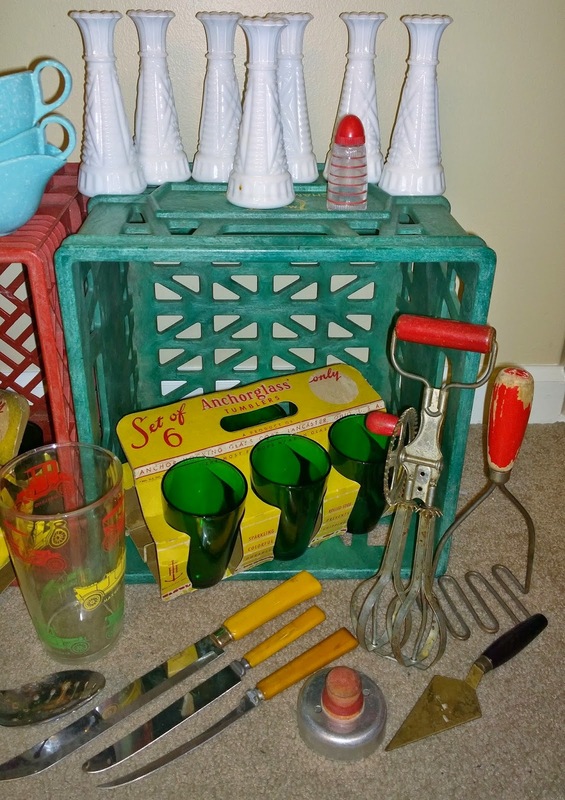 There's a lone nutmeg milk glass shaker and a partial Hoosier jar set. There's coffee, tea, and 2 spice jars. 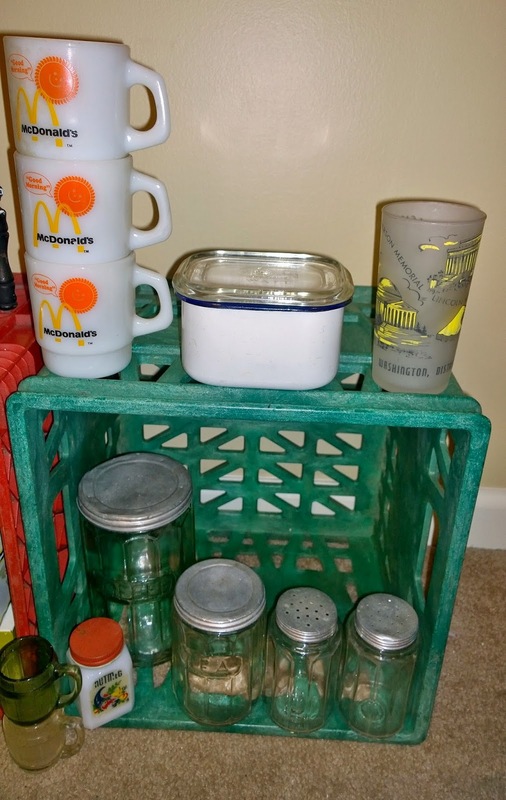 More vintage kitchen goodies. I can never pass up vintage kitchen when they're priced good. This Fire King gay fad bowl has the paint worn off in a few places, but still a lovely piece. Ahh, blue melmac... 2 creamers and a lidless sugar bowl. Then probably behind the lot of Pyrex, these green Anchor Hocking glasses in their original box were TOO COOL to pass up. I don't think I want to part with them, so maybe I'll keep one. Also there's a Hazel Atlas cocktail shaker sans lid. Why can I never find these things with their lids? Did people just get rid of the lid to have a bigger glass? And of course, several old kitchen tools. Still collecting milk glass vases for brides-to-be. I have them in so many shapes and sizes. The vintage market I'm doing in June always has lots of brides-to-be shopping it. 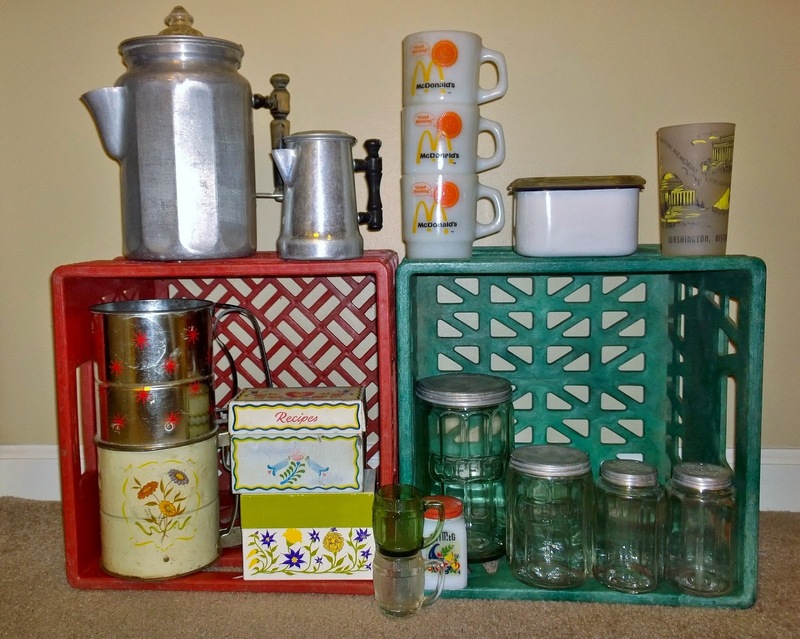 They're all looking to the same things: blue mason jars, milk glass vases, wood crates, and old suitcases. Check, check, check, and check! I always pick up lone salt or pepper shakers. I can't tell you how many of them I sell because someone is needing the mate! Of course there's more kitchen tools here. And I never pass up on bakelite handled tools. Ok, so this Dr. Ellis' Beauty Aids displays is REALLY cool. 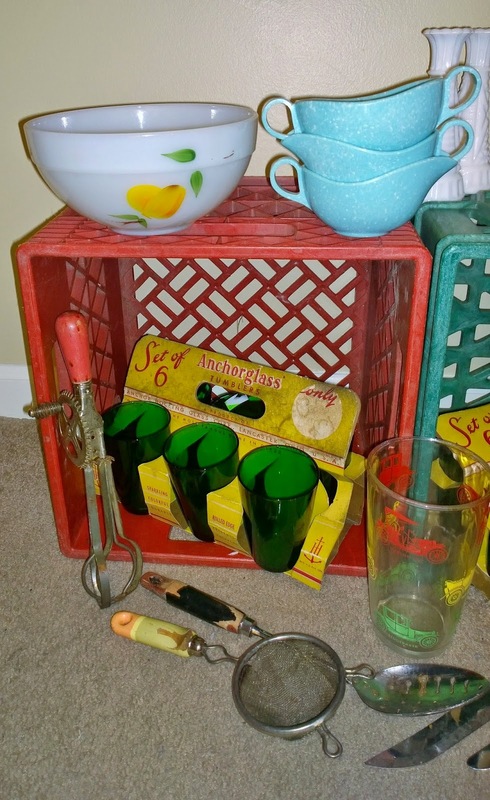 I think I may have to take back that my second favorite find are those Anchor Hocking glasses. This may have to be it... or at least they're tied for second. 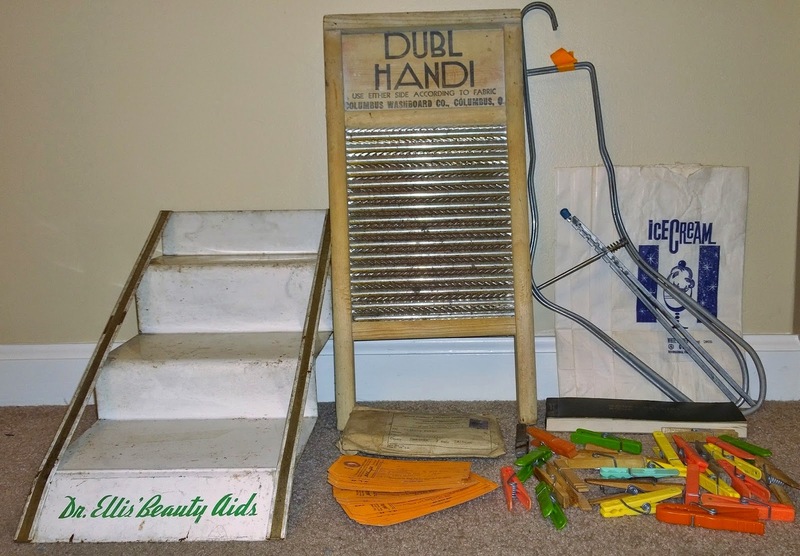 This old washboard is smaller than the normal one you may find. These vintage sock stretchers made me laugh. I had to pick them up. There's also a few ice cream advertising bags. 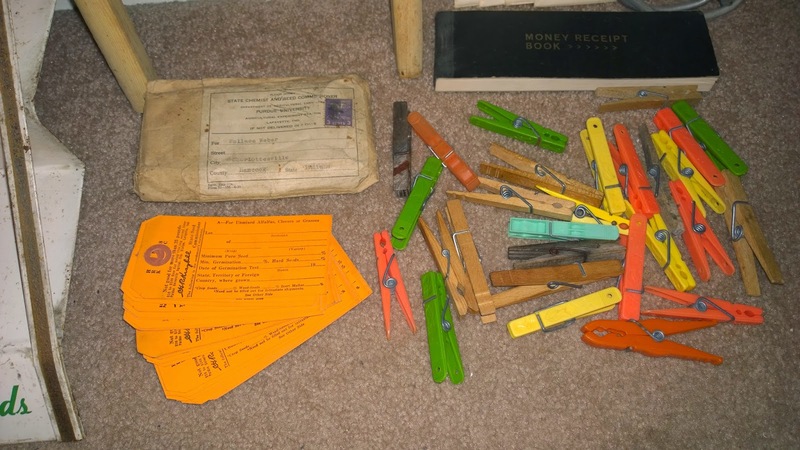 Some paper ephemera (tags & receipt book) and vintage clothes pins. The plastic ones say MADE IN USA and have floral designs on them. 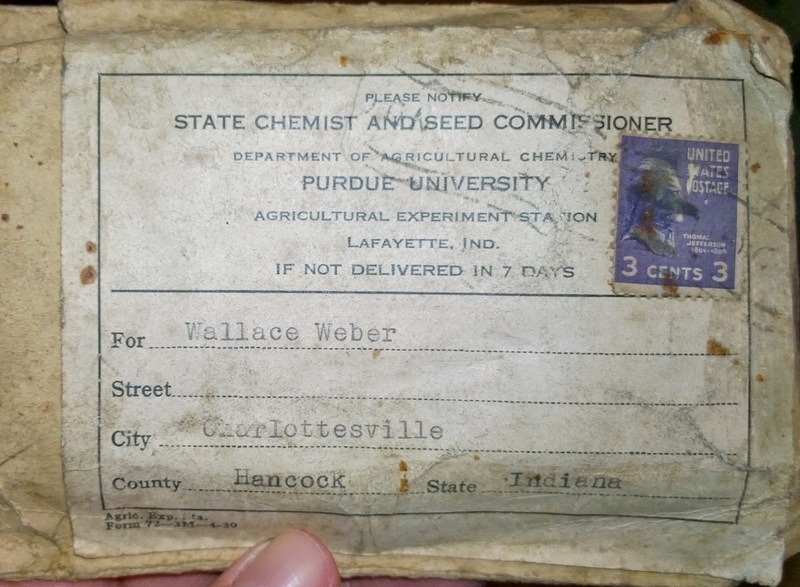 Original package that the tags came in from the State Chemist and Seed Commissioner, Department of Agricultural Experimentation at Purdue University. I was able to date these tags back to at least the 1930s, when H.R. 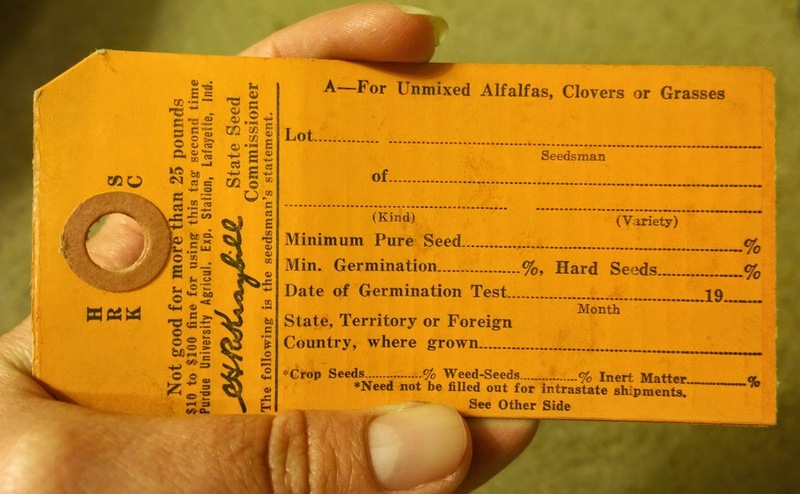 Kraybill (see tag) was the State Seed Commissioner. I have about 15 of these and thought someone would either like them for their historical value or for crafting/journaling. 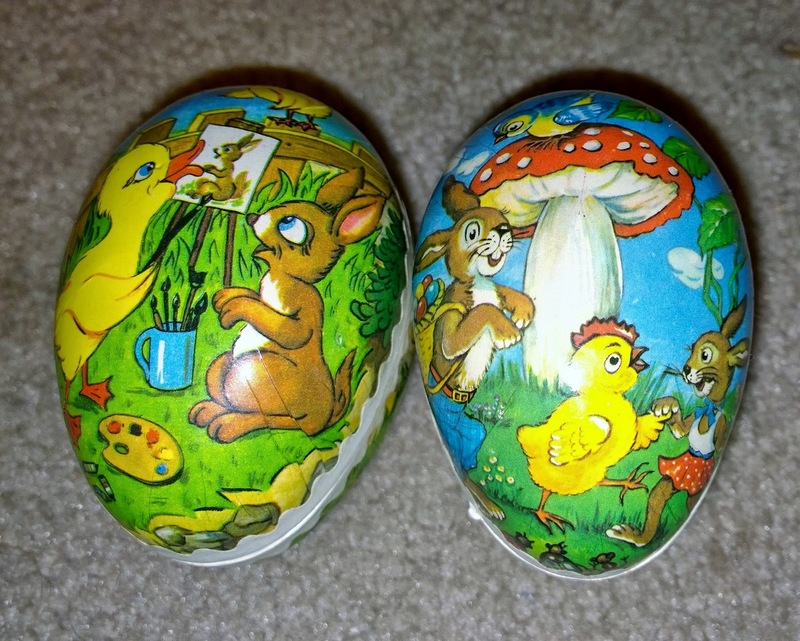 These West Germany candy containers make my total of these up to 4. I picked up 2 last week. These are a little smaller and still have the original plastic grass. You didn't think I was done, did you? Of course I had to buy something big. I scored all of these windows from the very last stop on my list. The older woman really wanted to get rid of them too! There's also an ornate frame and a Coca Cola crate. So, I collect the Spring Blossom pattern. I had a $15 coupon to eBay, so I splurged and bought these to nearly round out my collection. I even have the pitcher and drinking glasses with the SB pattern (Libbey made them). All I need to complete my collection are: the lasagna pan, the loaf pan, and the extra-large casserole (the 664). A reference of some of the spring blossom pieces that Pyrex made. I think I should get a nice print of this and have it framed! Well, that's it for this past weekend. As of today we are officially ONE MONTH away from the annual Woodruff Place Flea Market. I've attended it as a buyer and last year was a vendor. It was so much fun as a vendor. I am proud to be doing it again. Once I know my final location within the market, I will let you guys know. Wow. I could use 40 miles of awesome yard sales right about now. :) I had no idea about the McDonalds mugs -- thanks for the info and congrats on all of your scores. Wahoo! I have a single McDonalds mug that I bought at a garage sale for 10 cents. I still haven't tried to get rid of it yet but good to know that they sell. Congrats on all the Pyrex! You can totally tell how shiny those Primary sets are! Melissa, wow, wow, wow!! I want 40 miles of garage sales! You scored so many great things it is hard to pick my favorite. 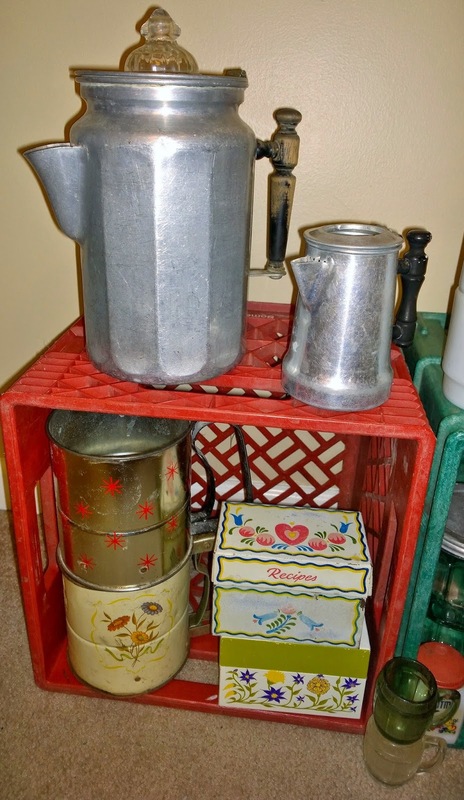 I do well with all vintage kitchen items so I always buy them, too. I do think the beauty aids display might be my have. I'm a Fire King fan, too! 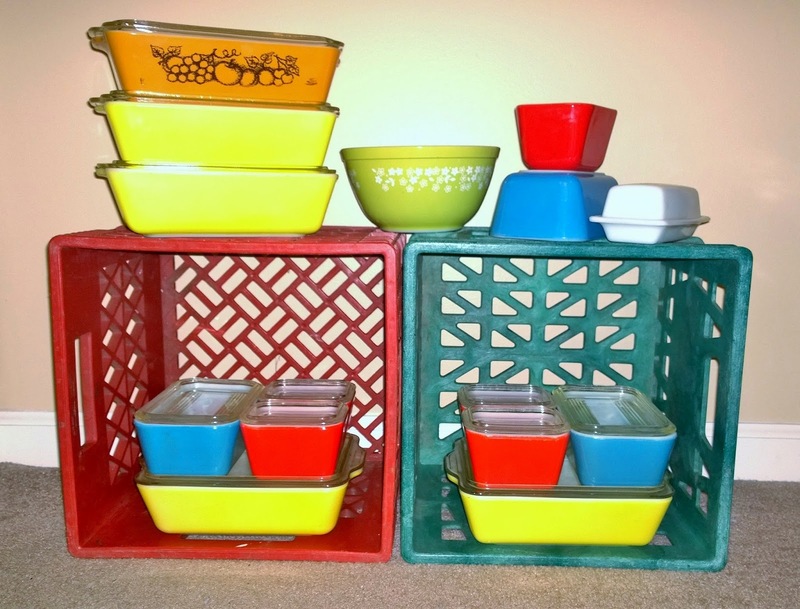 Wow, lots of great Pyrex! Hi! New follower here --- found you on Diana's blog with the list of goodies she won. Wonderful stuff here. I still have some of my mixing bowl sets from my wedding back in '68; the pieces are from the Pennsylvania Dutch set and the one in shades of avocado green and harvest gold (can't recall its name). I use them every day. The Fire King fridge pieces didn't survive. I never knew they'd have nostalgic value. Have a most blessedly bountiful and bountifully blessed day! Looking forward to seeing more of your lovely blog! Come visit me if you get the time! Oh, girl ... you scored big time! I love the coffee pot and the Christmas ornaments, not to mention the old windows. Love it all, actually. I found you at SYC, where we are neighbors. Oh my gosh, you are a girl after my own heart! 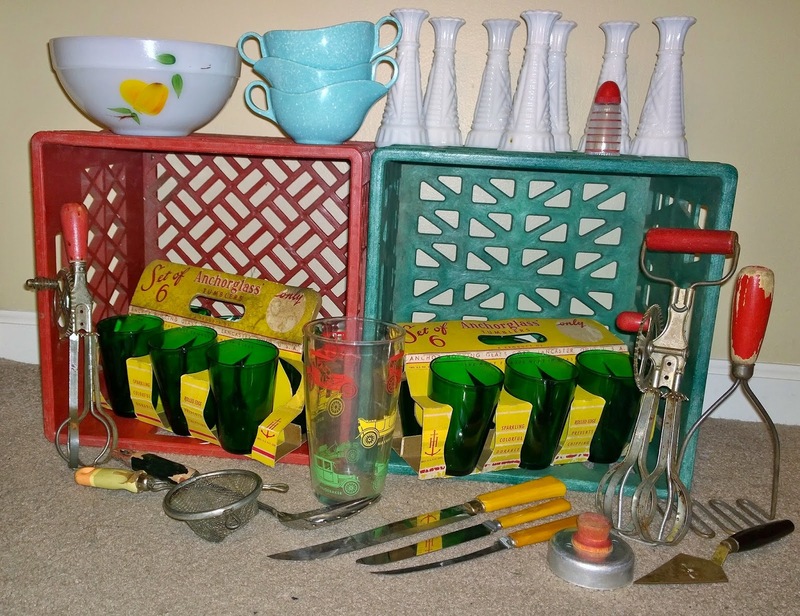 I adore vintage kitchen items and Pyrex is one of my favs. I only have 5 fridgies but love them and use them all the time. You really made a haul! Lots of fantastic things. Thanks so much for sharing them with SYC. Melissa what an amazing sale! Love the Pyrex, who can pass it up and vintage kitchen items. 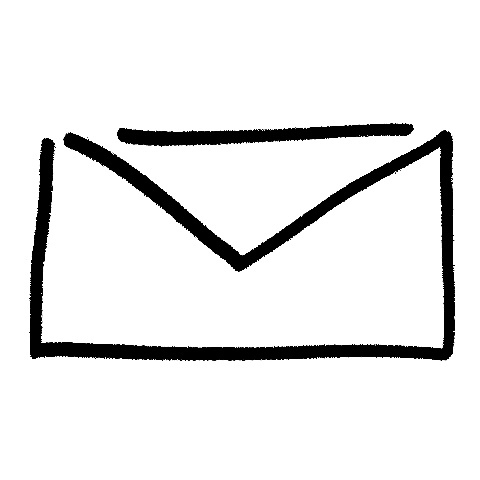 Thanks for linking to TTF. I saw you comment about being interested in hosting the party and I emailed Diann about it. She will probably get in touch with you. Sounds good to me! I have several 503s that are wobbly! I thought it was just me. The lids do not sit right. I also have a 502 that is wobbly. It's almost as if the dishes are warped. Wow, did you luck out! 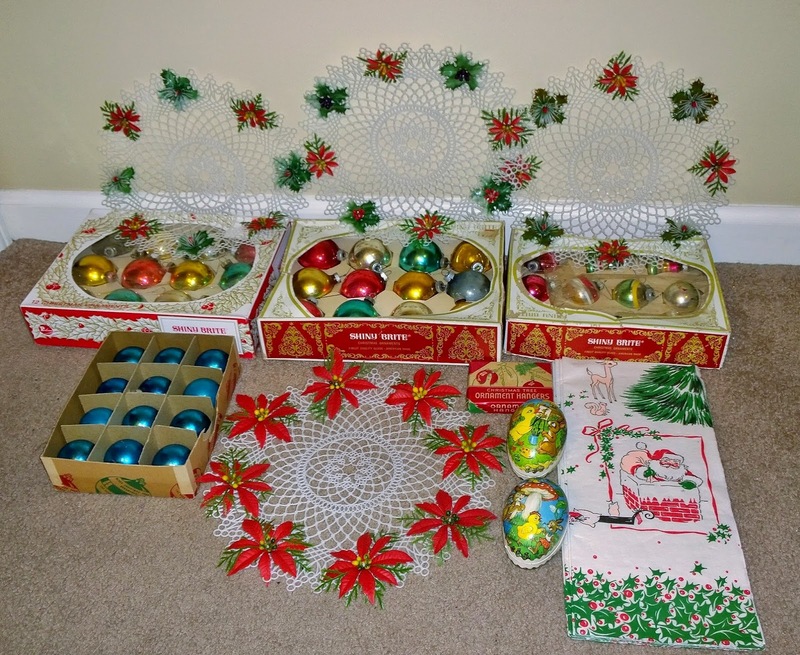 I'm loving that Beauty Aids display, all those windows, and of course the ornaments. Actually, I would have bought it all! !